At Carnival Corporation, we aspire to make a positive, lasting impact on every place we sail to with our guests and crew members. As we travel the world, it is important to us that our ships and crew are always warmly welcomed, that we bring goodwill and prosperity to the local residents and businesses at the destinations we visit, and that we foster enthusiasm for new adventures and help bring together people from different cultures. Our vision at Carnival Corporation is to consistently exceed guest expectations by delivering extraordinary vacation experiences at an exceptional value while also producing strong shareholder returns. To bring that vision to life, our family of 120,000 employees from over 150 countries has an enduring passion for doing everything possible to make sure our guests have a great vacation experience. We know our guests depend on us to make their vacation very special, and we take great pride in meeting that responsibility. At the same time, we are deeply committed to positive and lasting global impact by fostering and nurturing positive, rewarding and enduring relationships with our guests, crew members and shore-side employees, our community and destination partners, travel agents, partners and many stakeholders. We continually strive to ensure cruising is the most enjoyable vacation experience possible for our guests. 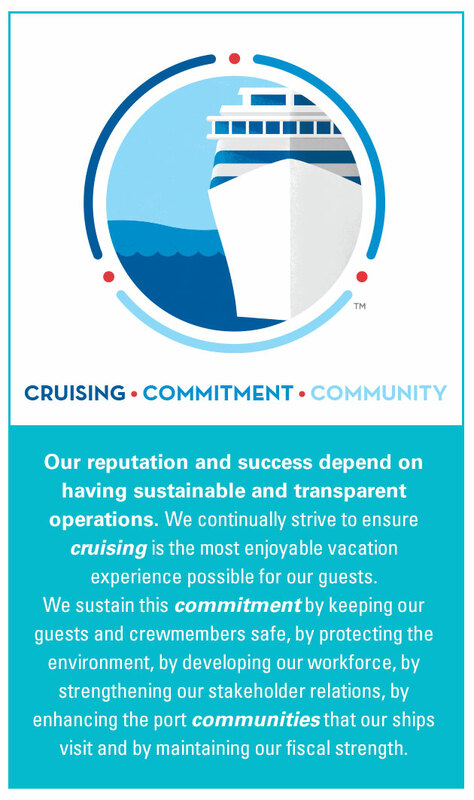 We sustain this commitment by keeping our guests and crewmembers safe, protecting the environment, developing our workforce of 120,000 passionate employees, strengthening our stakeholder relations, enhancing and supporting the port communities that our ships visit and maintaining our fiscal strength. Across our nine cruise line brands, we host over 12 million guests a year and visit over 700 ports of call around the world. The health and vitality of the oceans, seas and communities through which we travel are absolutely essential to our business. We recognize that to be a responsible and leading global organization, we need to incorporate sustainability in all aspects of our operation. We are committed to being a model for building community solution partnerships rooted in shared values. We also continue to make sustainable tourism a top corporate priority by minimizing our overall environmental impact, including reducing our carbon footprint, improving air quality, reducing waste generation and improving water use efficiency. Our latest Sustainability Report detailing our goals and progress is available here. We recognize the inextricable link between the health of our business and the vitality and sustainability of communities we visit and call home. We continually strive to promote sustainable tourism by contributing to our communities in a positive social, environmental and economic manner, working in conjunction with local governments, trade associations, tourism organizations, entrepreneurs and private sector leaders, and other community stakeholders. Our port and destination development group, along with our brands, work closely with port communities to develop popular destinations. Our teams also work with our extensive network of tour operators to support and ensure responsible shore excursions. The Carnival Foundation, our individual cruise line brand foundations, our brands and our employees support a variety of local and global organizations through monetary and in-kind donations, impactful philanthropic programs, employee fundraisers and hands-on volunteer initiatives. As part of our commitment to supporting our communities, during times of crisis, we provide emergency aid and relief through financial donations that we coordinate with various national and international relief organizations. We also frequently use our ships to deliver emergency supplies, and provide shelter and transportation in the affected areas. We continue to increase the number of partnerships we have around the world to create even more opportunities for our guests and crew to positively experience the places they visit, and also participate in various community and social impact experiences. A list of community partnerships and programs the corporation and our brands support is available here. According to the Cruise Lines International Association (CLIA), the cruise industry contributed $126 billion to the global economy in 2016, employing more than one million people and paying more than $41 billion in wages. Cruising helps create and sustain small, medium-sized and large businesses around the world, and generates jobs and income in many places where opportunities may be scarce. Cruise tourism contributes to the economic vitality of ports, neighboring communities and local residents. Carnival Corporation provides direct employment onboard our ships to the crew members that may have limited opportunities due to socio-political situations in their home countries. Crew members enjoy safe and stable employment onboard our ships, which enables them to support themselves as well as their families back home, and gain valuable work experience and training to further develop their skills. As the world's leading cruise company with nine global brands, we have made it a top corporate priority to preserve and respect the environment and communities in which we operate. We launched our Fathom brand and experience in June 2015, and pioneered social impact travel in April 2016 with an inaugural sailing to the Dominican Republic to give travelers meaningful opportunities to participate with locals as they tackle community-driven initiatives. In May 2016, Carnival Corporation became the first U.S. cruise company to sail from the U.S. to Cuba in over 40 years with our Fathom brand, and we have since received approval for several of our cruise brands to sail to Cuba. We recognize our responsibility to provide industry leadership and to conduct our business as a responsible corporate citizen. Through the collective efforts, passion and innovation of our entire corporation, we are committed to continue having a positive and lasting impact around the world and for our guests, employees, travel agents, partners and stakeholders, as well as communities we visit, and the oceans and seas on which we sail.